Here are some interesting extracts from our ElearningWorld staff when Joseph asked about the next 15 years of Moodle. 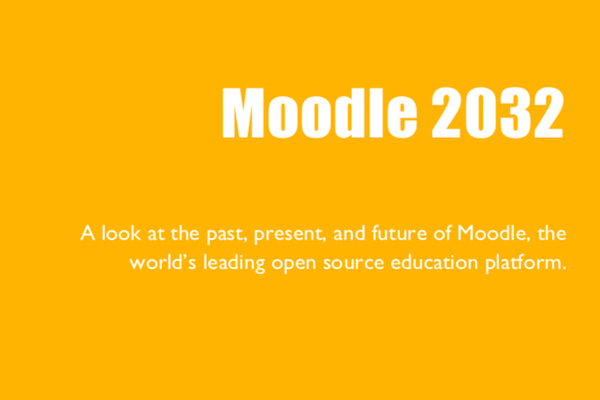 What do you think the Moodle community will look like in 15 years? Stuart: “I am always reticent to gaze into the future and make predictions. History is littered with predictions that seem so ridiculous in retrospect, and especially when they are related to any type of technology, which moves so quickly. However, let’s not let history put us off! The Moodle community has indeed changed over the last 15 years. The early days were dominated by enthusiastic open-source developers and teachers, all keen to get involved, have input, and share. To some extent, the Moodle User Association has professionalized this group, and provided a more formalised network for this type of user. The Moodle.org community has grown to millions of registered users. And the forums often feel like the wild west, with questions from newbies and experts intermingled. There are some amazing PHMs (Particularly Helpful Moodlers) who do a stunning job of supporting others, for free in their own time. But we also have to remember that many users of Moodle are consumers with little or no emotional tie to the platform. They treat Moodle like they treat their Word Processing application or Email client, and just want it to work, and get frustrated when a menu item changes location, or a term such as Home, becomes My Home, becomes Dashboard. What challenges have remained insufficiently dealt with or unaddressed by Moodle and other LMS? Gareth: “For Moodle: Over complicated UI with more than one way to do the same thing. Under the hood code feels like it needs to be optimized through analysis of function calls to ensure most efficient operation. Not quite ‘OO’ so elements cannot be easily overridden like the login page (might be addressed soon) etc. Stuart: “That’s a big question isn’t it? If I take the perspective of an end-user, a consumer of online education and training, I might be reasonably happy. I can access my courses from just about any computer with a browser, and doing the same on my tablet or smartphone gets easier almost by the month. Although Moodle has a strong set of built-in activities, I think it needs more. Although a highly skilled teacher might integrate SCORM, LTI, and HTML5 in their courses, for 99% of teachers they just use the tools in Moodle. Moodle has made mistakes here. No core Certificate module … really? In a learning environment! Feedback module included in core but hidden by default for years. A project to combine Survey, Feedback, Questionnaire to create what would be a stunning activity … still in discussion after many years. A Chat system that seems old-fashioned compared to our modern-day experiences on mobile phones. A fantastic Quiz system, that can’t share questions with the equally fantastic Lesson activity. make the average course more flexible, varied, and engaging. What are future needs/requirements that the community and developers should know about? Or reworded: what are upcoming challenges yet to materialize in full force? Stuart: “I’m sure most people will refer to mobile learning here. And for those with small budgets, expensive or restricted internet access, and limited to smartphones, then this is indeed vital. However, I think the real challenges are still around the concepts of how we make online learning as engaging, successful, and meaningful as traditional face-to-face, on-the-job, and other forms of more traditional social learning. For Moodle, one of the challenges is certainly how it responds to the competitors. Even though in most cases the products they have are lesser, the reality is they have marketing machines and drivers which operate in the commercial space far more successfullythanMoodle. It’s a sad reality that many company Directors and HR managers are influenced in their decisions by ‘what looks good’ (because they often don’t have the time to scratch below the surface or dig down into what the LMS is really going to deliver). Moodle ‘out-of-the-box’ still looks plain compared to others, even after all these years and many theme overhauls and changes of direction.